By C.G.U.Scheffer, State Herald of Sweden Coat of Arms no 63, July 1965.
, as they are called in the Act concerning the coats of arms of the realm of May 15, 1908. Both coats of arms are of ancient origin. The small one can be traced six centuries back in history while the great one is well over five hundred years old. In giving an account of the two coats of arms as described in the Act, it is thus historically correct to begin with the Small Coat of Arms. Furthermore, this forms part of the great one, which is a combination of several coats of arms. The Small Coat of Arms shows three crowns of gold in a blue field. The escutcheon bears a royal crown and may be surrounded by the insignia of the Order of the Seraphim. These additions will be discussed in connection with the description of the Great Coat of Arms which has several such exterior ornaments. The coat of arms with the three crowns was first used by Albrekt of Mecklenburg in 1364 when he became King of Sweden after having banished the native Folkung dynasty from the throne. It should be noted that the three crowns as introduced by King Albrekt became the coat of arms of the Kingdom of Sweden without at the same time being that of the reigning family. The House of Mecklenburg bore a crowned bull’s head. A coat of arms, originally, was not that of the realm but of the king. If the dynasty which first adopted a coat of arms governed a country for any length of time, the dynasty’s coat of arms gradually came to be recognised as that of the country. Thus the lion with the axe, from having been the arms of the Sverre dynasty, became the national coat of arms of Norway. It was not influenced by subsequent reigning families. The three lions in the shield strewn with hearts which appeared in the arms of the royal family of the Valdemars became Denmark’s coat of arms and have remained as the Small Coat of Arms and as the most important part of the Great Coat of Arms. Originally, the same conditions prevailed in Sweden. The coat of arms of the Folkung dynasty had become internationally recognised as the Swedish coat of arms. Developments, however, took a different turn with Albrekt of Mecklenburg. The three crowns came to be regarded as the first real Swedish coat of arms, created to designate the territory. The King used it the first time in a seal from the year 1364 in which the shield has a helmet with mantling and crest (Figure 1). Of great importance in this connection is the fact that in addition to the seal with the three crowns, Albrekt used another seal with a coat of arms showing only one crown (Figure. 2). Although only a single example of this seal from the year 1376 has been found, the two types can very well have come into use at practically the same time. Long before this, however, one, two or three crowns had been used as an emblem on coins minted by Swedish kings. This may have exerted a certain influence on the heraldic procedure. There has been much speculation about the significance of the coat of arms with the three crowns, and the discussion in regard to its origin has been going on since the sixteenth century without a definitive result having been attained. In 1917 and 1935 Harald Fleet-wood maintained, to some extent in agreement with Hans Hilde¬brand (1885), that the crown was a symbol of royal power, adducing numerous parallels from medieval coins and seals. In his opinion the number of crowns should not be considered of decisive importance. The coat of arms with the three crowns could be explained solely by its function as a symbol of royalty. Unfortunately, Fleetwood did not limit himself to this factual argumentation but went on to suggest that this coat of arms might have been that of King Erik, the patron saint of Sweden, who reigned in the middle of the twelfth century. This hypothesis, however, finds no support in the sources and has obscured the merits of Fleetwood’s work. Other scholars have assumed that the triad of crowns is symbolic in nature and have advanced various theories in explanation of it. It has been suggested that the three crowns represented the three crowned divinities in the heathen temple at Uppsala or that they symbolize the union of the three Scandinavian kingdoms during the late Middle Ages, or the three ancient territories in Uppland whose privilege it was to elect the king of the Swedes. Finally Dr. Heribert Seitz in his book De tre kronorna (The Three Crowns, Stockholm, 1961) derives the coat of arms of King Albrekt from that of King Arthur of British legend. Albrekt’s coat of arms shows the same arrangement of the crowns and the same tinctures as King Arthur’s. Though Arthur is supposed to have flourished in the fifth or sixth century, the coat of arms ascribed to him is not, as shown by the material collected by Seitz, recorded until the beginning of the fourteenth century. Seitz traces the heraldic device of the three crowns to the thirteenth century tomb of the Three Wise Men in the cathedral of Cologne. His argument is briefly summarized in his paper “Three Crowns as a European Symbol and as the Swedish Coat of Arms”, Recueil du 5e Congrès International des Sciences Généalogìque et Hér¬aldique à Stockholm (Stockholm, 1961). As we have seen, there have been many attempts to interpret the three crowns but none is quite convincing. It seems possible that there is something radically wrong about the way the problem has been approached. It has always been assumed that King Albrekt created a completely new coat of arms, but closer investigation shows that through his inherited coat of arms, Albrekt must already have been familiar with the crown as a heraldic symbol. As mentioned above, the princes of Mecklenburg bore a crowned bull’s head in their coat of arms (Figure 3). When, most likely for political reasons, Albrekt saw that he could not use his ancestral bull’s head in Sweden, it was only natural for him to retain its crown as a symbol of the royal power. We might perhaps say that the Swedish coat of arms arose through a heraldic diminution devised by its creator, a diminution of his own family coat of arms. This must have been the natural point of departure from which he could proceed. One of the component parts of the family coat of arms was the crown. The three crowns of Sweden are a further development of this crown. The above theory was put forward in my paper “The Coats of Arms of Sweden” which appeared in the 1963 autumn number of the American-Scandinavian Review in a series of articles dealing with the coats of arms of the Scandinavian countries. In Heraldisk Tidsskrift (Copenhagen, 1962), Ernst Verwohlt, incidentally, had suggested that there might be some connection between the three crowns of Sweden and the crowned bull’s head of Mecklenburg but his conclusions differ from mine. In my American article, which is here reprinted in revised form, I had no occasion to give an account of the material on which my theory was based. I have now done so in some articles published in Sweden as well as in a paper read at the Seventh International Congress of Genealogy and Heraldry at the Hague in 1964, entitled “L’origine mecklembour¬geoise des trois couronnes de Suède” which will appear in the forthcoming proceedings of the Congress. The interesting diminution observed on the medieval seal of the city of Stockholm may afford a parallel to the way in which King Albrekt proceeded. 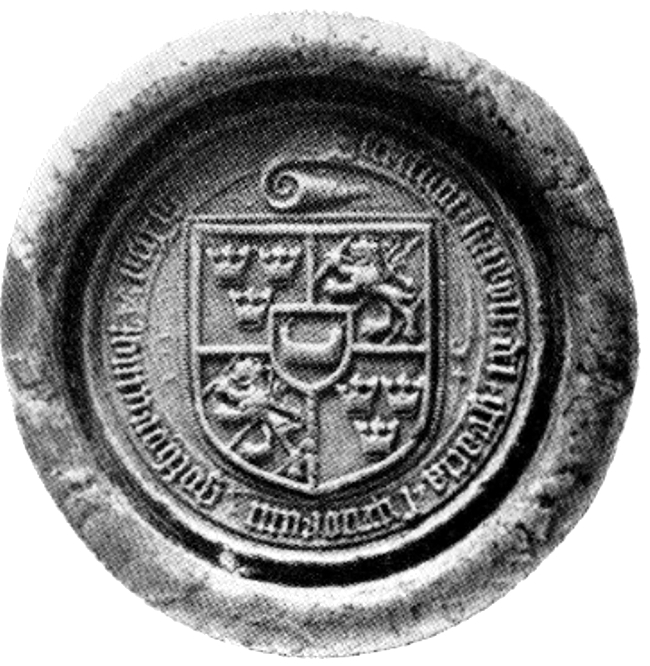 The seal of 1376 shows a king’s head but in the fifteenth century the crown appears alone in the escutcheon of the seal (Figure 4). Of great interest in this connection is also the coat of arms of the city of Malmö from 1437 which was based on the arms of King Erik, Duke of Pomerania and exhibits a similar diminution (griffin > griffin’s head). It should be noted that both mon¬archs were of North German origin and consequently had the same heraldic traditions. The Great Coat of Arms consists of a main shield, divided quarterly by a fillet cross formy of gold and of an escutcheon placed upon the centre with the dynasty coat of arms of the royal family. The first and fourth fields of the main shield which contain the three crowns are identical with the Small Coat of Arms. The second and third fields show in blue three silver bends sinister wavy, over all a golden crowned lion. Originally, this was the arms of the above-mentioned Folkung dynasty which reigned in Sweden between 1250 and 1363. This arrangement of the Great Coat of Arms occurs as early as in King Karl VIII Knutsson’s seal of 1448 (Fig. 5) and has been in use ever since. As often happens when two or more coats of arms are combined in a shield, fields of the same tincture adjoin each other, something which heraldry strives to avoid. In order to separate the four blue fields of the main shield the golden cross has been added. This symbol became especially popular through its allusion to the first name of the new Crown Prince, Karl — a name that had been borne by so many famous Swedish kings. 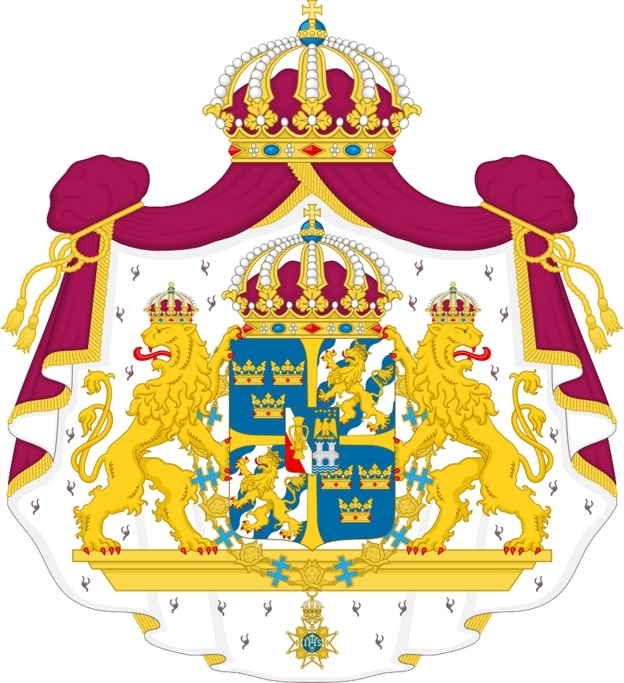 Charles’s Wain, or as it is called in Swedish, Karlavagnen, adds a Swedish accent to the Bernadotte dynastic coat of arms much in the same way as do the Vasa arms. It is a Northern counterpart to the Southern Cross in the national emblem of Brazil. It remains now only to describe the attributes to the escutcheons of the coats of arms. These can be traced to different epochs in history. The Royal crown is closed. It was Erik XIV who, at his coronation in 1560, exchanged the open crown of the Middle Ages for this particular kind. 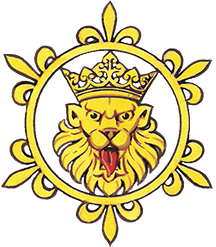 The two crowned lions which support the escutcheon of the Great Coat of Arms also date back to the latter part of the sixteenth century. In the Act of 1908 it is specifically stated that these lions must have forked tails which emphasizes their Renaissance origin as distinct from the medieval Folkung lions in the second and third fields. The insignia which are hung around the escutcheons of the coats of arms belong to the Order of the Seraphim, instituted in 1748. The name has been taken from the celestial hosts of the Bible, and in the chain six-winged seraphim heads alternate with patriarchal crosses. The crowned mantle which envelops the Great Coat of Arms can also be traced to the middle of the eighteenth century. The Act stipulates that the Great Coat of Arms may be used without the insignia of the Order of the Seraphim, supporters or mantle; the small one without the insignia. In its evolution the Great Coat of Arms can be compared to a cathedral to which generation upon generation has added new parts around a medieval nucleus, the additions being in accordance with the aesthetic ideals of each period. Inevitably, this has led to clashes in style but the various elements have a charm all their own and reveal to the properly informed the fascinating story of this coat of arms. Its development is closely intertwined with the eventful history of the nation. Casts of the seals by G. Fleetwood and S. Hallberg, photos by B. Lundberg, National Archives of Sweden.